One of the rituals of a skiing holiday is to have at least one fondue, after all skiing is hard work and mountain air sharpens the appetite and makes it absolutely OK to consume half your body weight in melted cheese. We are probably not going skiing this year – but the start of the Winter Olympics does seem as good as excuse as any to have a fondue, and to celebrate the achievements and years of hard work of all the athletes competing. Our fondue was prompted via a press release from cheesemonger Paxton & Whitfield and the arrival of an orchard selection box from Sainsbury’s containing different varieties of 4 apples and 2 pears (throughout the season they stock up to 57 varieties of English apples and 10 varieties of pears). The fondue set was extracted from the back of the under sink cupboard, and a bottle of meths was bought from one of the less salubrious shops in the North End Road. 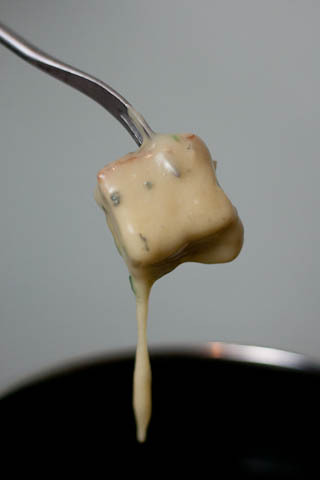 The fondue was made with Stilton melted into cider with cubes of Ed’s sourdough and pieces of apple and pear to dip. Although very rich, the fruit cut through the cheese nicely and the combination of this very English fondue was really rather good, and one to be repeated once per year, regardless of skiing or Olympics. 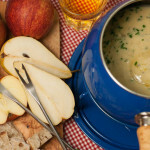 If you try this Recipe: English Stilton Fondue with Apples & Pears please tag #FussFreeFlavours on Instagram or Twitter. It is amazing for me when for me when you make one of my recipes and I really do love to see them. You can also share it on my Facebook page. Please pin this recipe to Pinterest too! Thanks for reading Fuss Free Flavours! 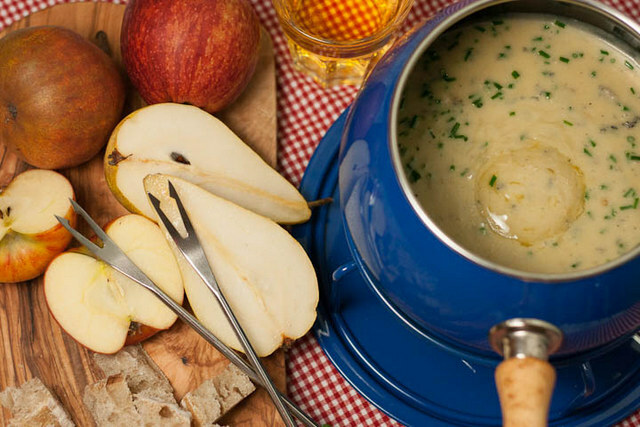 A fondue with a difference: sweet apples and pears dipped into a rich stilton sauce. Discard the rest of the garlic, pour in the cider (but keep a couple of tablespoons back) and heat to a gentle simmer. In a small bowl mix together the reserved cider and the flour into a smooth paste. Gradually add the cheese to the pan, stirring as it melts into the cider. Do not let the mixture come to a boil as it will split into oil and solids. Just before serving whisk in the Crème Fraiche and chives. Allow to warm back up and transfer to the table to serve over an oil or gel burner to keep it hot. Serve with cubes of bread, apples, & pears.